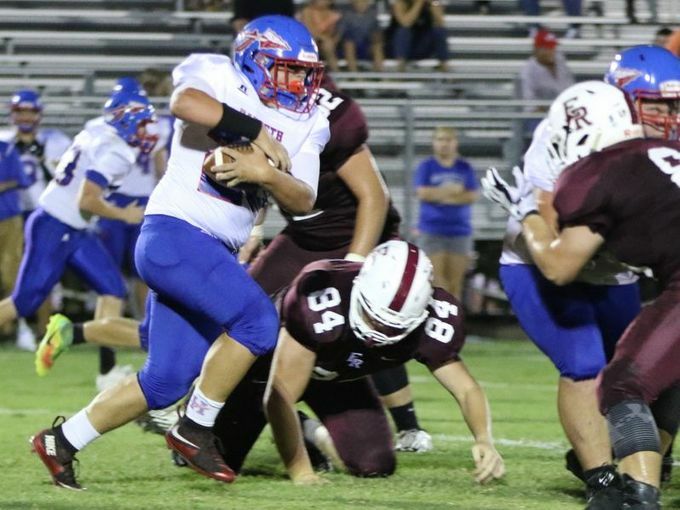 CROSS PLAINS – Fourteen high school football teams will converge on one location Friday night as the 2018 Robertson County Jamboree is hosted at East Robertson High School in Cross Plains on August 10th. Tickets are $8 for the event. The White House Blue Devils will play the sixth of seven exhibition games during the event against Cheatham County at approximately 8:15 p.m. All games are partial, exhibition and played usually one week prior to the official start of the TSSAA football season. Seven of the fourteen teams in the event are from Sumner and Robertson County. Clarksville Academy vs. Houston County – 4:30 p.m.
Greenbrier vs. DCA – 5:15 p.m.
East Robertson vs. Goodpasture – 6 p.m.
Springfield vs. Hendersonville – 6:45 p.m.
White House Heritage vs. Jo Byrns – 7:30 p.m.
Cheatham County vs. White House – 8:15 p.m.
Harpeth vs. Community – 9:00 p.m. The home team is the first team listed and will stand on the East Robertson sideline and wear home colors. The visiting team will wear alternate/road colors and stand on the opposite sideline. Fans should sit in appropriate areas behind their team, and fans should arrive early and remember that parking and seating could be difficult with the large number of schools in one location. The annual event is held at East Robertson High School located on Kilgore Trace in Cross Plains, with the athletic facilities located behind the school. Clarksville Academy is a member of Division II-A, West Region, and lost in the first round of the playoffs in 2017 to The King’s Academy, 62-14. After starting the season 3-2, the Cougars lost six straight to end the year. They finished sixth in their region. Clarksville Academy opens the season at Harpeth in week one. Houston County is a member of Region 6-2A and did not make the postseason in 2017. The Fighting Irish started 4-2 and then lost the final four games of the season and finished sixth in the region. They open the season week one at home against McEwen. The Bobcats started the season red hot in 2017 as a member of Region 5-4A, but the schedule came crashing in the final four weeks against with three straight losses to Springfield, White House and Jackson South Side. Greenbrier was competing for a region title up until week 10 and finished third. GHS opens the season at Kenwood. The Wildcats in Division II-A, East Region had a successful season in 2017, finishing second behind undefeated and state champion Friendship Christian whom they played in the regular season and the DII-A state title game. DCA opens the season at Goodpasture in week one. The Indians missed the playoffs in 2017 but finished fifth in Region 4-2A. East Robertson is the host for the jamboree and plays four Sumner or Robertson County teams during the regular season. ERHS hosts White House in week one to open the season. The Cougars in Division II-AA struggled in 2017 to finish with one win, but still made a playoff appearance in a division that is not very deep. Goodpasture’s only win came against rival Lipscomb Academy and then they lost in the playoffs to Grace Christian of Knoxville. Goodpasture opens the season at home against local rival and power DCA. The Yellow Jackets finished second in Region 5-4A behind White House, but got hot at the right time and advanced to the Class 4-A title game before losing to Greeneville. Springfield is the favorite to win the region and put a Mr. Football nominee on the platform in Dayron Johnson. The Yellow Jackets host Gallatin to open the year. Hendersonville competes in the brutal Region 4-6A and advanced to the first round of the Class 6-A playoffs in 2017. The Commandos were third behind Mt. Juliet and Lebanon and lost on the road at Blackman in the first round. Hendersonville opens the season at home in a rematch against the same Blaze team. The Patriots struggled with the toughest season in a young school history, failing to win a game and losing their head coach at the end of the year in Region 5-4A, playing only one game on their schedule within a single digit margin. Heritage opens the season in week one at West Creek. The Red Devils finished third in Region 4-1A and advanced to the second round of the Class 1-A playoffs before losing to semifinalist South Pittsburg. Jo Byrns opens the season at Cascade in week one. The Cubs finished second in Region 6-3A behind Fairview, but despite hosting a first round playoff game, fell to East Nashville in round one of the Class 3-A playoffs, scoring only a field goal in a low-scoring 13-3 matchup. Cheatham County opens the season at Hunters Lane in week one. White House won Region 5-4A and completed the first 0-10 to 10-0 turnaround in TSSAA high school football history, but banged up on the interior line heading into the playoffs, White House saw the season crash in the second round at home to Jackson South Side. The Blue Devils are picked second in the region this year behind Springfield and open the season ironically on the same field as the jamboree, returning the following week to play East Robertson. Harpeth missed the playoffs, finishing fifth in a very tough Region 6-3A and beating only Stewart County for the lone region win. The Indians start the season at home against Clarksville Academy in week one. Community competes in Region 5-2A and also missed the playoffs, beating Summertown and Loretto but landing fifth in the standings. The Vikings open the season at home against Cornersville.